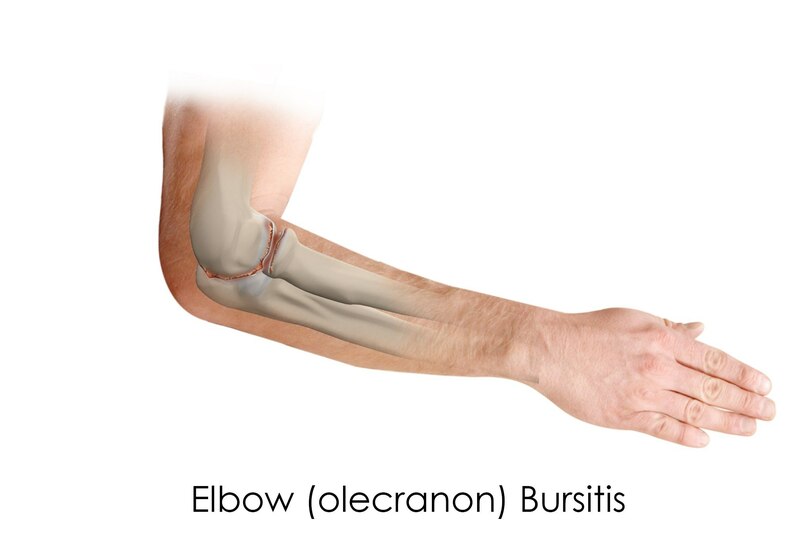 The elbow contains a large, curved, pointy bone at the back called the olecranon, which is covered by the olecranon bursa, a small fluid-filled sac that allows smooth movement between the bone & overlying skin. Inflammation of this bursa leads to a condition called olecranon bursitis. The causes of elbow bursitis may include trauma or a hard blow, excessive leaning on the elbow, infection through puncture wounds or insect bites, or conditions such as gout & rheumatoid arthritis. Certain occupations such as plumbing or air conditioning technicians, which involve a lot of crawling on the elbows, are highly prone to this condition. Swelling is your first symptom of elbow bursitis. As more & more liquid fills into the bursa, the swelling increases, causing pain, which increases with direct pressure or bending of the elbow. If the bursa becomes infected, your skin can become warm & red, & may spread to other parts of the arm or even the blood stream if not treated immediately. Elbow bursitis can be diagnosed by reviewing your medical history & undergoing a thorough physical examination. Your doctor may also order an X-ray & biopsy of the bursa fluid to test for infection. Treatment for elbow bursitis depends on your doctor's advice. If bursitis is caused due to an infection, your doctor may recommend removal of fluid from the bursa with a needle & prescribe antibiotics. Non-infected elbow bursitis can be treated with an elbow pad to cushion your elbow, avoiding activities that place direct pressure on the swollen elbow, anti-inflammatory medications to reduce swelling, or injection of corticosteroid medication directly into the bursa to relieve pain & swelling. When these methods do not help, the bursa is surgically removed. In a few months, a normally functioning bursa grows back.